Olean Police Department Officer Ryan Alyor gets busted filing false charges against victim who has always stood his ground and spoke out against local corruption. 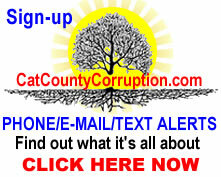 Will charges of official misconduct be filed against him and will he be arrested and charged for filling falsified police reports in violation of New York Penal Law § 210.45, or will he be promoted and revered like they normally do in Cattaraugus County with highly corrupt public servants? Alyor is more interested in destroying the lives of innocent hard working people then he is in bringing to justice individuals who commit real crimes where there is a real victim, like criminals who run over people in clearly marked crosswalks, or others who attack people with knifes or bottles. Will Alyor be held accountable for his crimes or will he be rewarded like they normally do in Cattaraugus County where you have to totally corrupt to get a raise? In a county where you have real law enforcement they arrest corrupt cops who make false arrests. In Cattaraugus County New York they do the exact opposite. Click to enlarge. 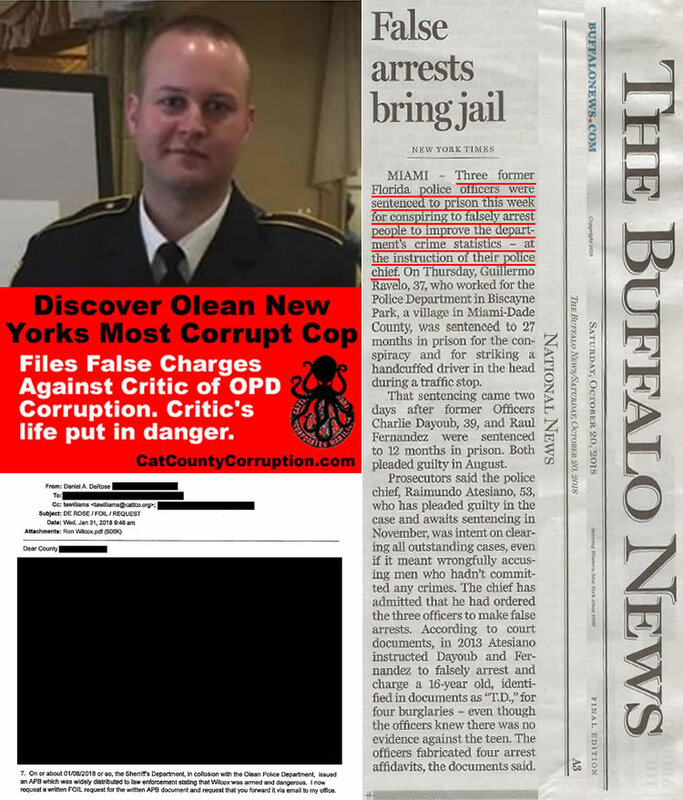 Ryan Alyor is touted as the top DWI cop in Olean NY, once you start researching this cretin you will discover he has no problem lying on the stand and committing other illegal acts as a local deep state enforcer. He will look for the slightest reason to pull his intended victim over and if that doesn’t work out he will just lie. That can be easily seen when he testifies in court when up against a good attorney. 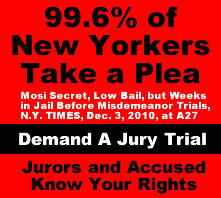 In states and counties where they have real law enforcement, they arrest corrupt cops. 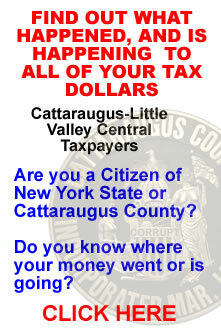 In Cattaraugus County New York they reward them. The only problem with that is Mr. Wilcox’s license was valid and had DMV records to prove it. Further proof that in this county if you stand up for your rights and the rights of others you will be targeted by the corrupt local deep state elements like Aylor in an attempt to shut you up, which includes attempted murder. The proof is provided below. Aylor ‘arrested’ i.e. kidnapped, Mr. Wilcox on the same day as Mr’s Wilcox’s daughters birthday. He needed bailed out and his car was towed costing him more money. 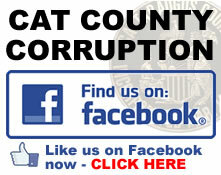 Mr. Wilcox is an outspoken critic of the corruption in the Olean Police Department. We believe Mr. Wilcox’s problem started back in 2017 when he was at a local pub for lunch. There were just two customers there at the time, him and another man at the end of the bar. All of sudden the man at the end of the bar slammed his mug down on the bar and demanded another drink. Mr. Wilcox asked the belligerent customer to settle down and recognizing him he told the man he knew who he was and how the man had no problem setting up people on criminal charges and used his influence to get charges dropped or reduced against his own family members. The belligerent thing got up and left. Who was the belligerent customer? 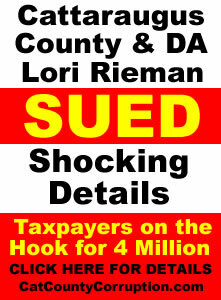 It was none other the John Ensell, cover up artist for the Corrupt District Attorney’s Office. 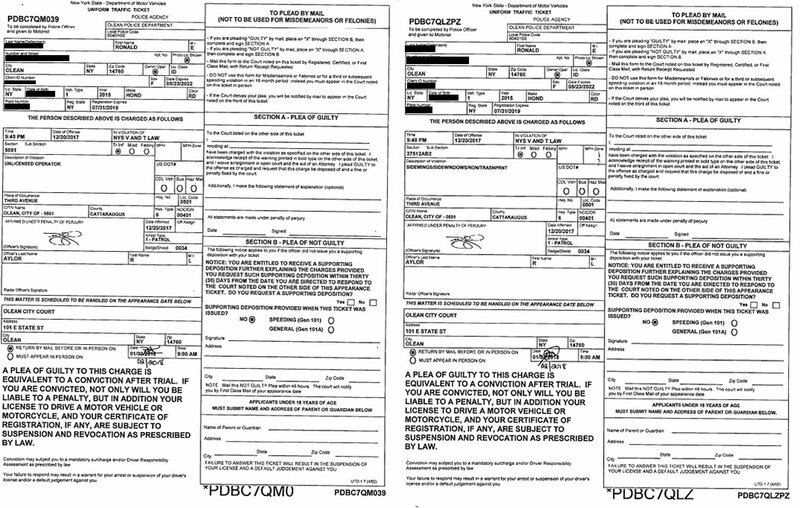 All of these incidents occurred before any of Mr. Wilcox’s “legal issues”. Mr. Wilcox then noticed more police presence in the areas he visited and his business. Within months Mr. Wilcox was arrested for DWI under questionable probable cause by Aylor. 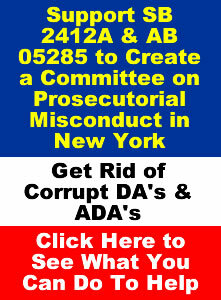 Who is the prosecuting attorney in the DWI Matter? Why it’s none other than the corrupt Assistant District Attorney “Hit and Hospitalize” Ensell. Mr. Wilcox then has his license suspended because he did not trust Aylor concerning the breathalyzer results. He asked for blood sample be drawn at OGH but was refused. Ensell, in her normal vindictive and retaliatory mindset showed up at the DMV refusal hearing to take over for Lying Ryan Aylor. Even the judge questioned why she was there. His lawyer Mr. Dan DeRose filed an appeal in November of 2017 and his driver’s license was restored that month, i.e. suspension was stayed. 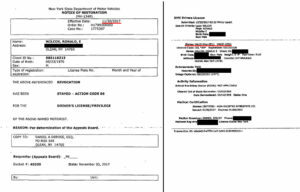 Mr. Wilcox was then picked up by Aylor for unlicensed operation and aggravated unlicensed operation on December 20, 2017, right before Christmas. These were completely false charges. Aylor is guilty of filing false instruments, among other crimes. Mr. Wilcox’s license was valid at the time as the DMV documents prove it, both before and after the false arrest. The first image is a copy of the DMV order dated November 30, 2017 showing that his suspension was stayed and the second one dated December 22, 2017 is a DMV call response with the DMV transaction code showing that his license was also valid right after. Aylor failed and/or refused to show up at the unlicensed operation hearing and the charges were dismissed. The most troubling aspect of this whole episode was what happened next. 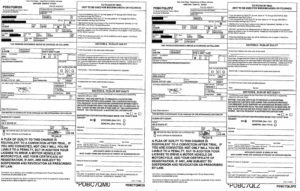 These bogus charges eventually led to a all-points bulletin (APB) being issued against Mr. Wilcox’s for no reason, which could have led to his being shot dead by the corrupt Olean Police Department or a trigger happy cop somewhere else. They didn’t bother informing him in anyway. He found out through his lawyer who was also very surprised and worried about it. APB’s are only issued for dangerous persons, like someone who just robbed a bank and is armed. It appears that in Cattaraugus County, specifically Olean New York, you are considered armed and dangerous if you stand up for your rights and the rights of others. To make matters worse, soon after Mr. Wilcox was away from home one day the Cattaraugus County Sheriff’s Deputies and State Police showed up at his house attempting to confiscate his guns in violation of his 2nd amendment rights. This shows you just how corrupt they all are. In the United States you are eight times more likely to be killed by a cop than you are a terrorist. They took away Mr. Wilcox’s 2nd amendment rights by illegally confiscating his guns claiming that a charge of aggravated unlicensed operation allowed them to do so, which is a complete lie, another complete fabrication. Mr. Wilcox has also been having unknown individuals show up at his home. Doing things like entering his driveway and laying on the car horn to wake him and his family up in the middle of the night. One was a silver ford explorer. Mr. Wilcox’s next door neighbor’s had their tow trailer vandalized around this time. The trailer sat very close to Mr. Wilcox’s property line and it could have easily been mistaken for his. 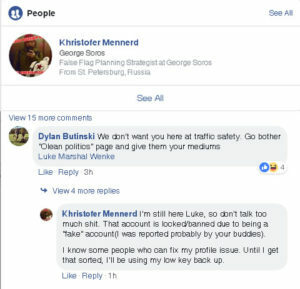 Certain individuals have been identified as harassing and intimidating Mr. Wilcox and this website and its contributors, one such individual is a Christopher Maynard, who also goes by the name of Mistopher Chran, Christopher Mahn and Khristofer Mennerd (which is actually just the Christopher Mahn profile) Mistopher Chran is, or was the administrator on one of the areas largest facebook groups, the Olean Area Traffic and Community Safety Alliance. This group always shuts down comments as soon as its members start calling out the corrupt Olean Police Department, or other corrupt public servants. Maynard/Chran/Mahn also lied when he claimed he has never been to court in one breath, yet brags about how he is in court all of the time. Further, Maynard/Chran/Mahn admitted he owes a silver ford explorer. You can’t trust a word this thing says and who is he really working for? Notice how he sets up false narratives? Has he ever done that in court? A Dana Roth and a Bobby Nogrom, who also goes by the name of Bobby Morgan would also appear on the scene. These cretins appeared when we investigated and posted on the local dog shooting in Olean by OPD. We were viciously attacked by them and they would bring in out of state individuals, one of which animal rights activist to support the shooting of the poor dog. Aren’t animal rights activist supposed to defend animals? 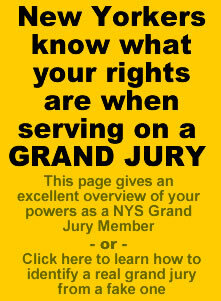 The man who posted the video was viciously attacked by Roth, who also attack Mr. Wilcox, a contributor to this website and a well known animal rights attorney out of Buffalo, posting their alleged charges filed by the corrupt deep state elements. The man who posted the dog shooting incident had hit and killed a person after coming back from his doctors office medicated on prescriptions, not drinking or on some type of illegal drugs. We would discover that Roth was busted for DWI years earlier when she drove her car the wrong way down interstate 86 and ran headlong into a semi. In a strange twist of events we also discovered that she is related to the man who posted the video on the dog shooting. Shows you how twisted these things are. Roth was also identified by two witnesses as being present in the Olean City Court at one of Mr. Wilcox’s hearings on the unlicensed operation. She was on her cellphone the whole time giving a play-by-play description of what was occurring to someone on the other end. She left soon after Mr. Wilcox’s hearing had ended. 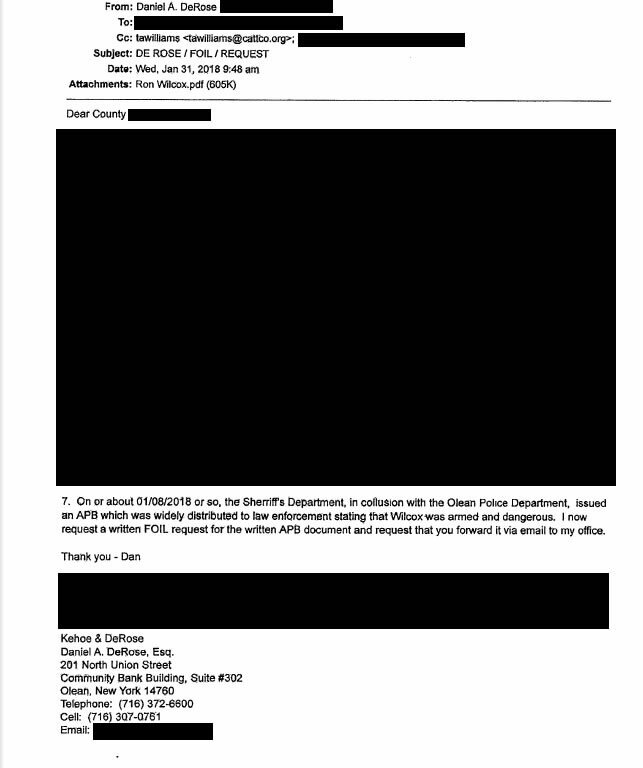 Mr. Wilcox FOIL’ed the Olean Police Department for the surveillance videos but what he received was illegally edited and did not even show him entering or leaving the building. He was nowhere to be found on the video tapes. Our facebook page was shutdown because of their bogus complaints. 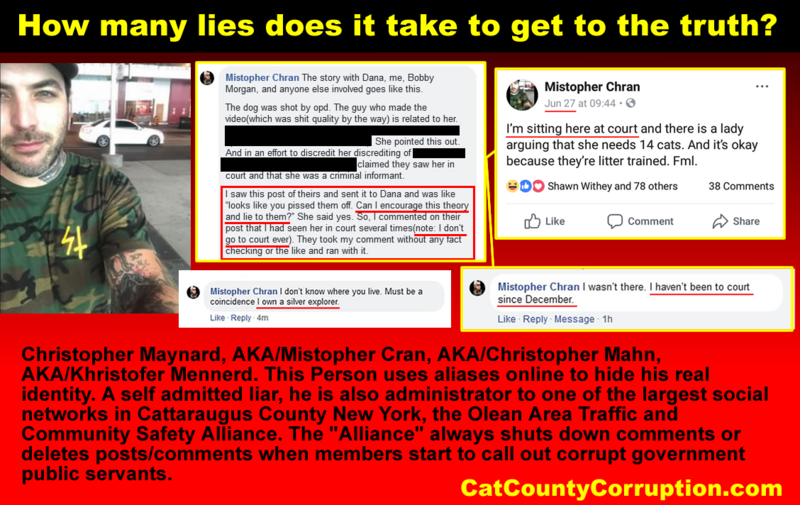 What was interesting to note was within five minutes of calling Maynard/Chran out as a corrupt confidential informant on our Cat County Corruption facebook page it was shut down. It has since been restored. This entry was posted in Catt Co, Catt Co Important, Catt Co New, Catt Co Popular, State and tagged aggravated unlicensed operation, Blovsky, Bobby Nogrom, cattaraugus county corruption, Christopher Maynard, Dana Roth, Khristofer Mennerd, Khristofer Mennerd fake facebook account, mistopher chran, olean new york, Olean New York Court Corruption, Olean Police Department, OPD Officer Robert Blovsky, Robert Blovsky, Ryan Aylor on September 23, 2018 by CatCoCorrupt.